If the men who designed those half-assed glass water shields in European (and some American) showers had to clean up the mess on the floor, they would be gone in no time. But, they know that FEMALE maids clean the rooms, so they do not give a damn. Do not get me started on the nutsy design and booby traps built into European bathrooms. Sometimes I photograph them. One of the most ridiculous was in Oviedo, Spain, a bedroom with a computer desk facing a picture window that looked into the bathroom with a prime view of the toilet! I guess you are supposed to get work done on the computer while your mate relieves himself or herself! And black sinks that show every bit of soap, toothpaste and shaving cream, which makes even the fastidious traveler feel like a pig! Design esthetics are trumped by the esthetics of reality. Dark colored sinks like this one in a hotel in Barcelona look great when you first walk into the bathroom, but in reality they show in high relief toothpaste, shaving cream and any other residue making the bathroom a perpetual mess. Photo by Gerry Dawes©2014 / gerrydawes@aol.com / Facebook / Twitter / Pinterest. Panasonic Lumix DMC ZS30 43-86mm f3.3 – f6.4. The other great stunt that has become a plague in the past decade or so is removing bidets and replacing them with high sinks--you get the picture. Then there are the "modern" shower fixtures that it takes three days in a hotel to learn how to operate. And usually, the more expensive hotel, the worse the bathrooms are configured. At one high end joint, there was a magnificent deep stone-and-tile bathtub with a rain shower. Catch: To turn on the shower, you had to get in the tub and reach under the shower head to turn it on, which guaranteed a cold water dousing as your wake up call. Photo: Hotel room horror shows: Madrid, booby-trap shower. Note rain-head shower, which you will not figure out how to turn on without help from the front desk, so first you get your body zapped by four horizontal shower jets that shoot cold water on your body (in my case, shooting a jet of ice water onto my cojones!). Then, when you figure out how to shut that off, you can't figure out the rain shower, which is fortunate because you would be doused with cold water from above. The first day, I ended up showering with the 'telephone' shower head. By the second day, with some careful experimentation, I managed to figure out which of three handles and a changer device how to turn on the rain shower with just a shot of cold water on my arm! The personnel at this Madrid hotel, who otherwise has many commendable qualities, know about this crazy design and to their credit, admit that they know it. Makes you wonder if some hotel executive's relative designs or sells bathroom fixtures. Photo by Gerry Dawes©2013 / gerrydawes@aol.com / Facebook / Twitter / Pinterest. Panasonic Lumix DMC ZS30 43-86mm f3.3 – f6.4. And lest I forget, the damned nórdico or duvet, an hermetically sealed pressure cooker bed covering guaranteed to ruin a night's sleep. Every time I check into a hotel and forget to tell them that I need it changed to sheets and a blanket, then return to the hotel after midnight, I consign myself to a bad night (body too warm, arms too cold, a war with my internal thermostat!). Hotel room booby traps: Madrid, the dreaded evil nórdico or duvet, which has become a plague in Spain in recent years. It is basically a quilt encased in a sheet, which traps most of one's body heat under the cover, resulting in a pressure cooker effect. It is like trying to sleep in in a stewpot, except that any parts of you outside the 'nordico' are at a sharply lower temperature, which for me makes sleep impossible. Last night was horrible, got it changed today to sheets and blankets and got a decent night's sleep (for Spain, six hours). Photo by Gerry Dawes©2013 / gerrydawes@aol.com / Facebook / Twitter / Pinterest. Panasonic Lumix DMC ZS30 43-86mm f3.3 – f6.4. 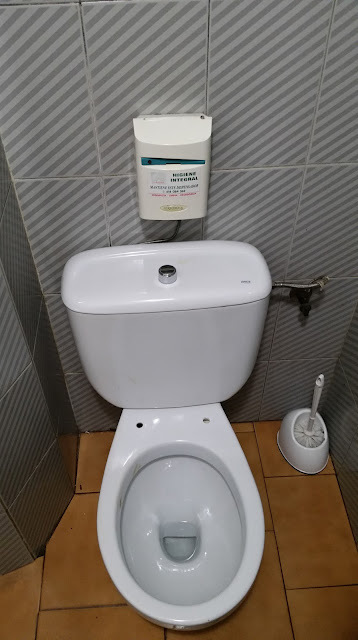 Hygienic toilet in Ronda, Spain.